I am lost in a forest of thoughts and ideas and they all look alike and after a time I realize I have been going in a circle because I am passing the same un-acted upon ideas and having the same negative conversations about why they exist and why I can't make them happen. I looked for a picture of myself today in a trunk in an effort to free myself from the concentric circles I grind into the ground and before I found what I was looking for I found what I needed. 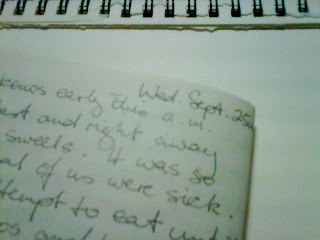 This was the journal my mother took with her to Greece the September before she died. I made it and another one for myself so we would have some small books to document our travels. 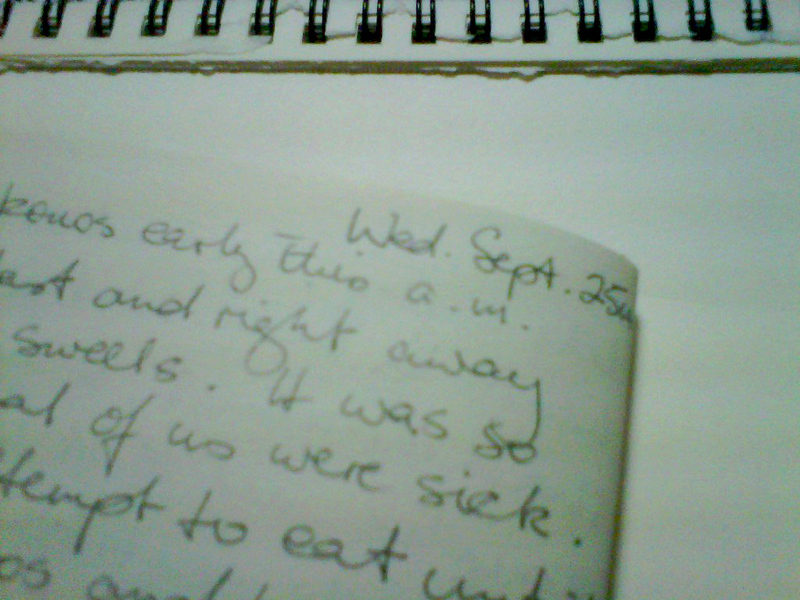 She was already very sick by then and so she only wrote in it a few times. I wasn't startled as I might have been that the last date she recorded nearly matched today's date. I took it as a sign. It is my discovery so I can attach my own meaning to it. My mother has stayed connected to me even though she is no longer here breathing the air, growing old, she faces no complications and so she has time to encourage me as she always did. I am struggling as I always do and now with the additional weight and confusion of peri-menopause which seems like a dragon I must fight with all the time that breathes fire onto my anxiety level and sparks it ablaze driving me deeper into the woods. I choose to take these small discoveries as moments of salvation where my mother reaches out and taps me on the shoulder and encourages me to move ahead and because I am a dutiful daughter, I do. I try to think of one thing at a time in order to get out of the forest of my mind that I so often get lost in. The little photo I was looking for will be used in a piece I am making for a show in my hometown at a gallery that my mother was involved with for years. The piece is about who we are based on where we came from. 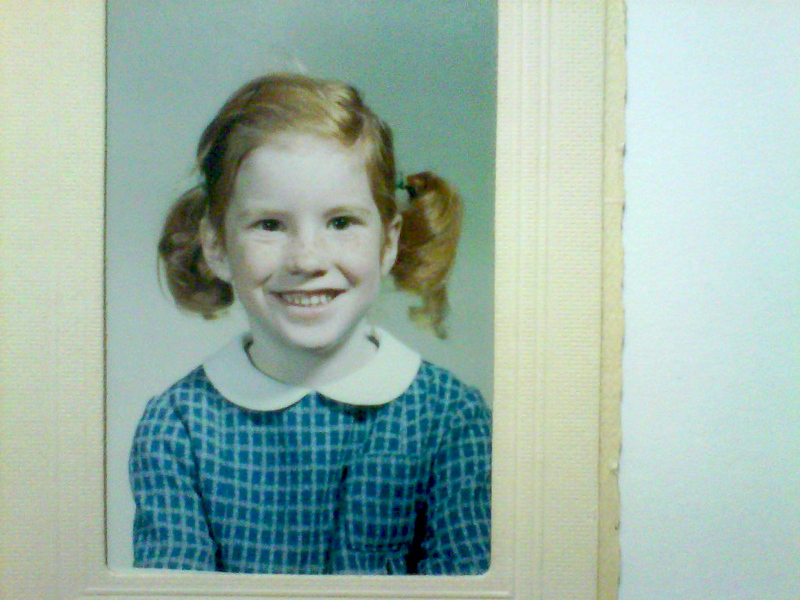 I grew up in a northern town beneath a beautiful mountain with a sparkly blue glacier and everyday it watched me. If I can make the piece and get it off on time I think I will be making some progress in knowing the way out of the darkness I often find myself in. September 5th. I feel a bit contracted but I also feel kind of stoked. I'm worried about money but I also feel like there is endless potential work if I just flip the switch. My mood is up but I feel nervous about that too because it changes so quickly but mostly I have been trending up into that good place where I feel both happy and calm, if I can battle the anxiety I will have achieved a trifecta of sorts. The days are shortening at both ends but it's most noticeable in the morning when I awake in the darkness. My mid morning walks have been refreshing and warm once I get out to the road where there is more sun. There are spider's webs everywhere and yesterday I picked an albino woolley bear off my car tire in an effort not to squash it. 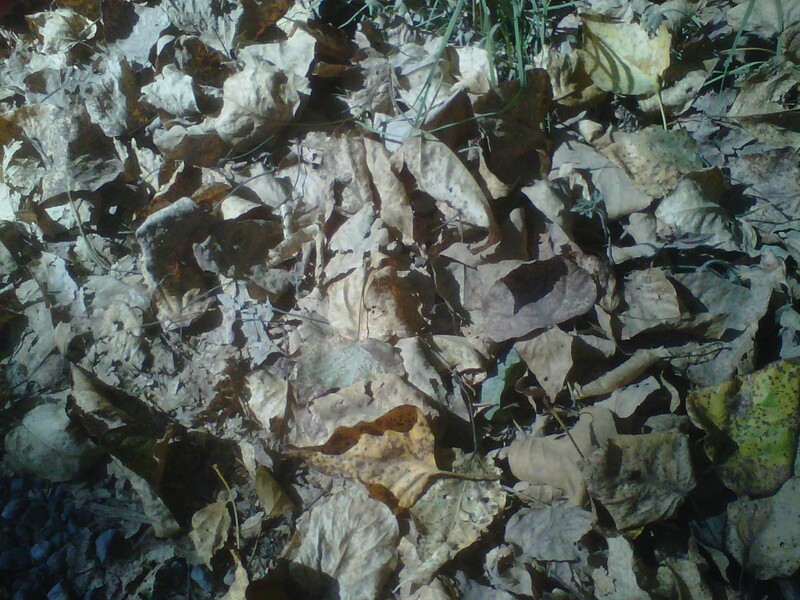 The edges of the road are dry and crunchy and when I go to feed the hens there are more leaves down, they are mostly green but getting yellower by the day. Have finally begun to sleep better after a long stint of not being able to achieve that deep state of unconsciousness. It wears me down so and weakens my mind, I feel frayed and bare after a while. As you can see by the start date of this post I have been a bit slack. On the other hand I have been working and the kid is back at school and the routine has been good despite the first day when I felt like I was falling into a big pit of sameness. A week or so has passed and my happy state seems to be taking hold. I can honestly say I am looking forward to fall.